I am participating in another OBS through Proverbs 31 Ministries and their Blog Hop. This particular post isn’t being “linked up” due to my lateness in finding the time to sit down and write, however, I am looking forward to Blog Hop Thursdays and the community of bloggers who participate throughout this study! Speaking of which – this brings us to the first Blog Hop topic! COMMUNITY – What does community mean to you? What do you need from community? What can you give to community? I view community as a body of people who share life together with purpose. 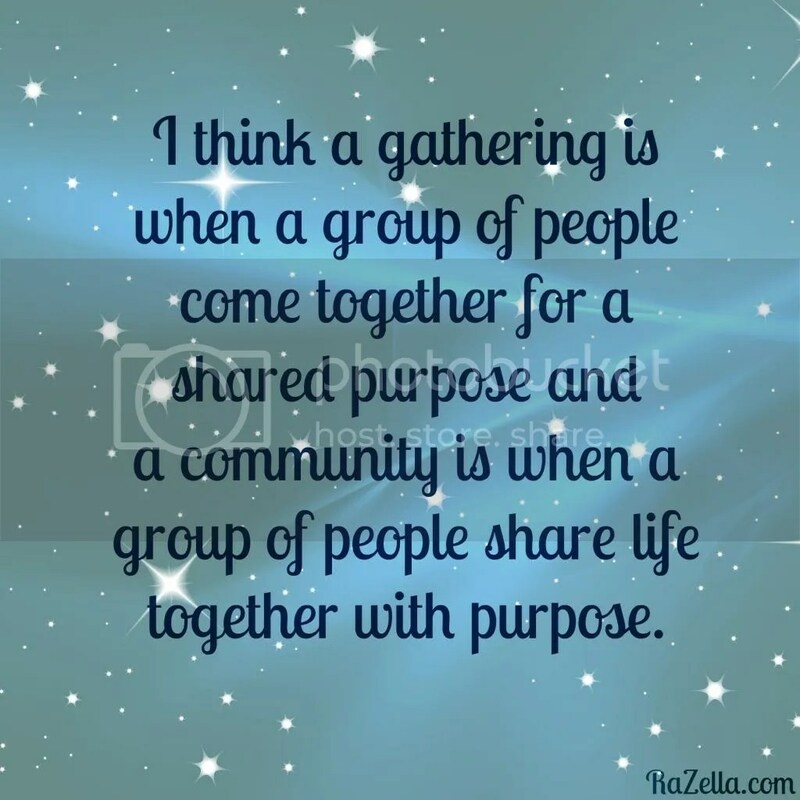 It’s different to me than a “gathering”, because a gathering is for a shared purpose. When you gather with people, you may or may not ever really know them. 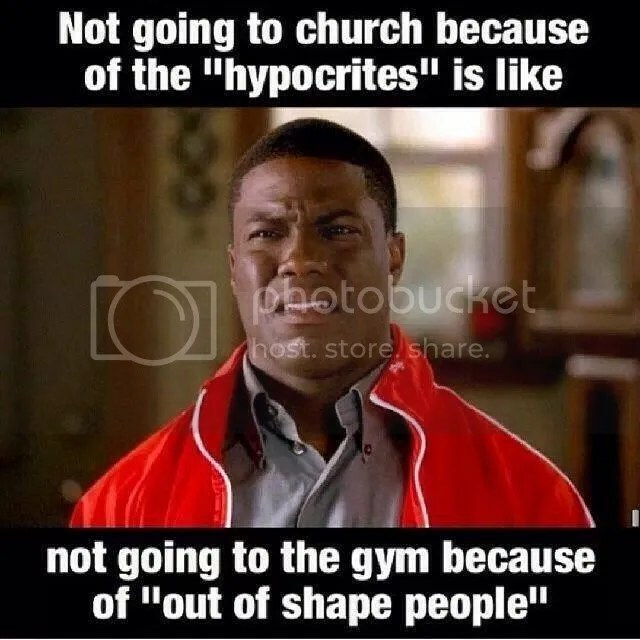 An example would be in large churches, we gather together to worship the Lord and may never even meet one another depending on how large the church is. I don’t believe that is a bad thing in and of itself, I think the danger comes when that is as far as our idea of “community” goes. Speaking of which, I have to share an image I came across on Facebook this week as I can’t get it out of my mind, especially with this topic…. I have to chuckle because it’s true. We are imperfect people striving towards the same goal, to be more like Christ, completely dependent on the Grace of God. I want to grow in my Faith and I know it’s the Lord’s Will for me to mature because He says so in scripture (Colossians 2:6-7). A Godly community, people whom I am sharing life with and living together with that purpose, is one of the many ways the Lord helps me to grow. People who are living their lives together know one another, which means we have the opportunity to love and serve one another, therefore fulfilling God’s Will per His commandments (John 13:34-35). Serving is vital to our Christian growth because Jesus came and served. How can we expect to be like Him without learning how to serve? Community helps us to do this. Community helps us admonish one another. When we live outside of community it’s easier to get “picked off” by the lone wolf prowling around. Sometimes it’s the wolf within that attacks first. A community of people living with you will know, and will then have the opportunity to point it out and encourage you in Godly love to overcome through Christ. I am most thankful for the women who have admonished me in love and walked alongside me through trials. I know my family is thankful to have had the blessing to walk alongside other families. To know someone on a deeper level, to pray for them, to feel compassion for them, and to act out of that compassion I think gives us beautiful glimpses of what Jesus did when He walked the earth and of the compassion He feels for us. Without getting into a debate about self-esteem (another blog for another time) I think it’s easy to say we struggle more with putting others first. At the very least, I can say I DO. I need to live in Biblical community so I have constant opportunities to put others first. Other Godly women spur me on to Love my husband, children, and extended family. My husband and son spur me on to love others. All of this is done under the covering of Loving God first. It means I give of my talents (spiritual gifts), my time, financially and emotionally, to others in the community who are in need of my giving. It also means there will be others to meet my needs when they arise. It grows me beyond myself, it grows my understanding to love deeper. It grows me to be more like Jesus. Which I think means community is a precious, complex, beautiful gift from God. Yes, our human-ness will at times mess it up, bringing sin into a beautiful gift and causing frictions and irritations. The reality is that is a beautiful part of it too. Those frictions and irritations serve as opportunities for us to fulfill other commandments, like forgiving as we have been forgiven. God tells me His forgiveness is ENOUGH, so I don’t need to waste time trying to “forgive” myself. If I could do that, I wouldn’t have needed a Savior to reconcile me before a Just and Holy God. I am however called to forgive others. Community gives me that opportunity as well, as I’m positive others have found themselves having to forgive me. As we forgive, our faith continues to grow. If you really sink into thinking about just how much community can grow you in faith, it’s pretty amazing, and humbling. a remarkable plan for community. He is Glorified as our Faith Grows in Community with one another. My hope and prayer is that everyone out there would take off their mask and allow themselves to be transparent and part of God’s community. Want to check out an awesome Online Community of Bloggers who are living lives together with purpose? Check out the link up 🙂 and please make sure to let me know if you blogged about community too so I can drop by and leave some comment love! So much goodness in this post!